Pav bhaji is not merely a snack, it’s a complete meal in itself. Originated in Maharashtra – India, it’s a very popular street food all over India. It’s easy to make, delicious and spicy, ideal to be served at a get together. Pav is a baked Indian bread but not sweet like a bun. Bhaji is a mixture of vegetables, boiled, mashed and cooked. And any other vegetable as per your choice. All vegetables boiled and mashed. Place a shallow frying pan over medium heat and pour a little oil in it. Once the oil is heated, add cumin seeds and allow them to crackle. Now add chopped onions, stir and cook for 2 – 3 minutes. Add ginger paste and garlic paste, cook until onion turns light brown in colour. Add chopped tomatoes and chopped chilli and cook until tomatoes are cooked. Add mashed potatoes, mix and cook for 3 minutes. Then add boiled and mashed vegetables, add some water as per requirement and mix well, preferably using a masher. After 5 minutes add tomato puree and all spices i.e. coriander powder, red chilli powder, amchur powder, garam masala and salt to taste. Tip: 1. Add some boiled peas, without mashing and some cottage cheese (Paneer) after adding the tomato puree at the final stage. This will enhance the taste and looks of the bhaji. 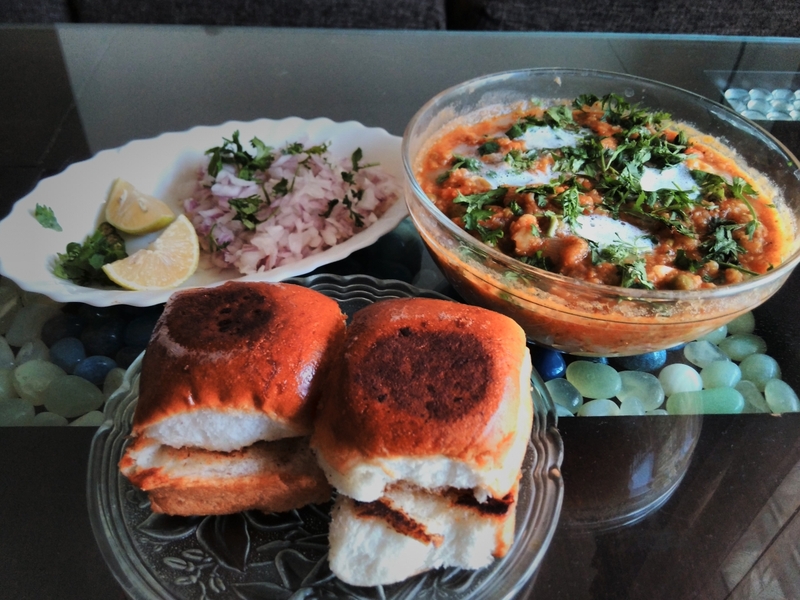 Cook for next 5 minutes, sprinkle pav bhaji masala, mix well and cook for 2 minutes more. Remove bhaji from heat and transfer to a serving dish. Garnish with some butter and green coriander. Cut the pavs horizontally to make 2 slices of each pav and toast them applying butter on the tawa (flat pan), flipping both sides. Tip: Toast the pav only until light brown in color otherwise they might get burnt and become too hard to chew. Transfer to a serving plate and serve hot with bhaji.